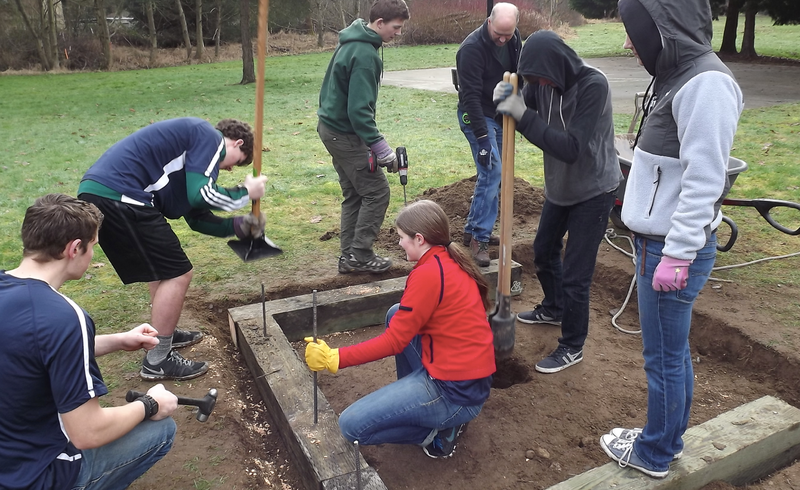 Proving they are proficient with tools on land as well as sea, the Eastside Peak Crew, The Yankee Clipper’s Woodinville based second crew, spent the last day of January building a new horseshoe pit at Wooden Creek Park. Service hours for advancement can come anywhere your community needs you. 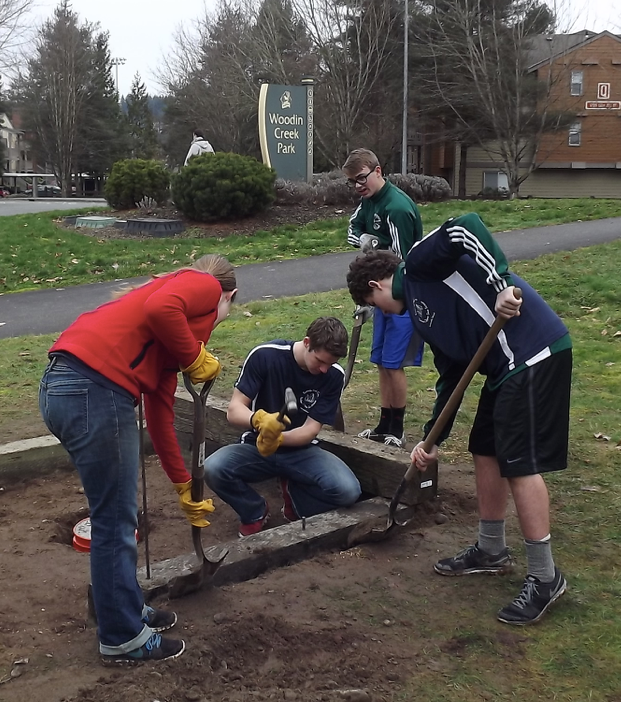 In this case, the City of Woodinville was unhappy with the little used horseshoe pit in the park, which is located alongside the popular Sammamish River Trail, off 131st avenue NE just South and West of the city’s downtown. The old pit was in a hidden part of the park, where it sat unused and increasingly overgrown with trees and brush. As is often the case, you don’t have to tell Yankee Clipper Sea Scouts twice that you need help (well, ok, sometimes you do…but not often). Saturday members of the crew formed in the park. First up, they demolished the old pit, and restored it to a natural condition. Mother nature, grass, moss and a little Northwest rain will quickly remove all signs of the old pit. Next up, it was time to build the new pit in a much more visible location in the park, between the parking lot and a basketball court. The new location is right near the entrance to the park and will be much more visible, even to people just driving by. With supplies provided by the city, the Yankee Clipppers got to work laying out the new pit. It turns out you need to think about that just a bit. It turns out there is a National Horseshoe Pitchers Association and they have a pretty specific set of regulations for building a pit, how far you need to put the stakes, how far from the stake a backwall needs to be, etc. Ben Hess, the Mate for the Eastside Crew says the crew liked the challenge of laying it all out. With lots of laughing the team cut out the grass where the pits would be, and started pounding in the stakes. Hess reports that some members are crew are getting a little stronger, as they broke a sledge hammer and a heavy tamper in the process of building the pits. They also learned a valuable lesson that boat builders think about, measure twice, cut once. When cutting timbers for the back and sides of the pit, the youth made a slight mistake in where to put a cut, and they had to improvise a solution so that we had enough material to finish the job. 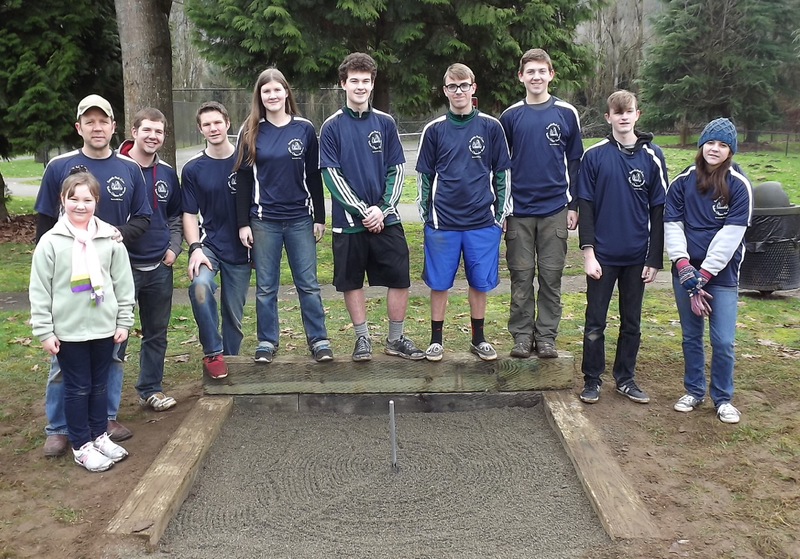 But after about 5 hours, the City of Woodinville had a nice new amenity in one of its parks, and all these mostly Apprentice Sea Scouts were on their way to meeting the 16 hour service requirement for Ordinary. 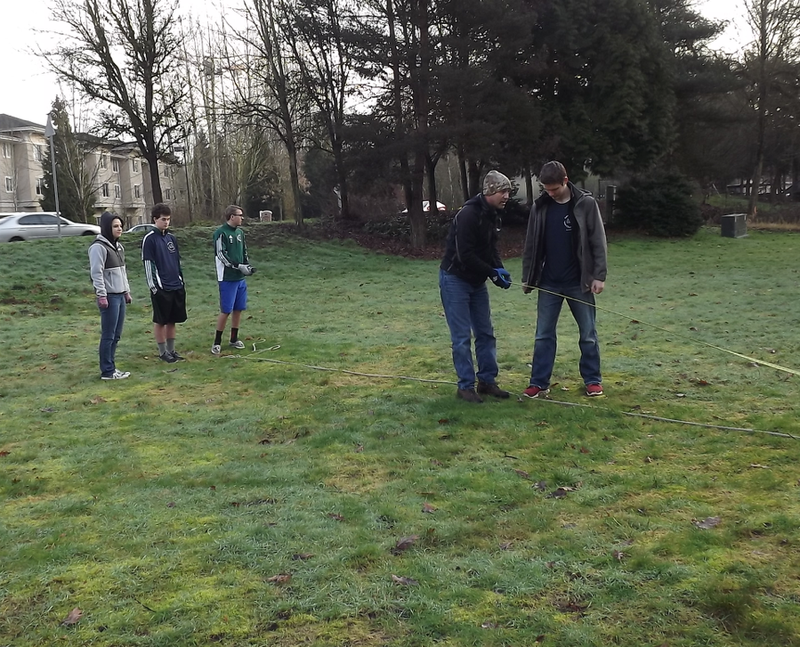 And, of course, when they were done the Sea Scouts tried their hand and a little horseshoes. For the record, Sea Scout Micah Perry scored the first ringer. But observers noted that it was pretty clear this was the first time most of them had ever tossed a horseshoe, and they probably should stick to sailing their boat. Hmm, sailing seems easier than tossing a horseshoe onto that post.